Today we’ll be looking at the concept of cognitive dissonance. While we tend to consider cognitive dissonance to be an affliction most targeting non-preppers and Obama fans, the truth is that patriots engage in it just as much as anyone. Unfortunately, even though we scoff at others, we are being rendered just as ineffective when we fall victim to it ourselves. Cognitive dissonance refers to a situation involving conflicting attitudes, beliefs or behaviors. This produces a feeling of discomfort leading to an alteration in one of the attitudes, beliefs or behaviors to reduce the discomfort and restore balance etc. Deborah C. Tyler at American Thinker talks about how cognitive dissonance has resulted in a near carte blanche state for Obama, stating that “The immensity of Obama’s disloyalty is key to why people cannot face the truth about him.” It’s a fantastic read, and will explain how dissonance works, as well as what subdissonance is. Patriots are just as susceptible to dissonance as anyone. We may be better informed about certain things than the average person, but we’re still human. One classic example is the knowledge/belief that OPSEC is important, juxtaposed with the constant behavior of posting photos, videos, and information about things that should remain secure and internal to a group. The feeling of discomfort occurs, and people adjust their belief, rather than their behavior. When confronted about their poor OPSEC people often change their attitude to fit their behavior instead of the other way around. They do this in several ways. Taking a “bring it on” attitude (seen in statements such as “They can go ahead and come and get me if they think I’m doing something wrong!”) The problem is, as we’ve seen lately, they will do just that. Then what good are you? Defensiveness (verbally attacking or attempting to undermine the credibility of the person calling attention to their OPSEC failure). These types of statements boil down a resistance to behavioral change. The problem is that we do know that OPSEC is important, and therefore we run into a problem. Do we change our behavior to come in line with what we know is true? Or do we find a way to alter our beliefs so that we can continue in our current patterns? Sadly, many choose option 2. This is one of the biggest areas where patriots fall victim to dissonance. We all know that physical fitness is a necessary and even critical part of our training. Even so, look around you at your next group meeting. How many of your fellow patriots are obese? You’ve almost certainly heard the same type of statements we just talked about, applied to the physical fitness aspect. “I don’t care HOW fat I am, if ‘they’ show up at my door I’ll give them a run for their money.” This is the “bring it on” attitude we saw in the OPSEC section above. “I don’t need to be physically fit. 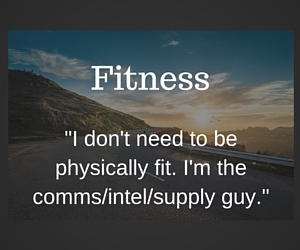 I’m the comms/intel/supply/etc. guy.” Yes, you do. We all do. These and many other statements get said all the time by patriots who, deep down, know better. We can all do better at our physical fitness—myself included. One of the more dangerous areas to experience dissonance is that of vetting your people. 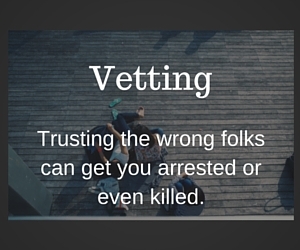 Trusting the wrong folks can get you arrested or even killed. It can compromise your entire group, and even the larger movement. Even though we know these things, evidence of cognitive dissonance abounds. Below is a list of actual statements that people have said to me regarding how they vet their people, or what’s involved in their decision on who to let in their group or whether to trust them with information. If you are willing to expose yourself, your family, and your group to danger because of some noble (and misunderstood) idea about what privacy is or what is acceptable in terms of vetting, then you should not be in a group. In fact, you’re a liability, plain and simple. This statement alone shows a lack of understanding of a host of basic concepts: privacy, security, OPSEC, COMSEC, basic infiltration, the list goes on and on. Trusting your gut is always a good thing. Refusing to collect any other information to confirm your gut reaction, however, is not. One last area where patriots exhibit dissonance is in the area of training. In fact, patriot training can be summed up thusly: We all like to do what we like to do, and we don’t like to do anything else. We offer a myriad of reasons why, all of which camouflage the basic fact that we are engaging in cognitive dissonance. We know we need to train in a variety of areas. We know a lot less than we should, and we’re already aware of it. In the face of the belief/behavior disagreement, however, we will find ways to rectify that disagreement that doesn’t involve a behavioral change. Again, here’s a list of actual statements made to me while discussing the need for varied training within the patriot community. We often don’t like to admit it, but there are definitive, proven, unassailable truths in the patriot movement and prepping in general. We know them, we may even preach them…yet our behavior doesn’t match. We engage in the equivalent of someone who talks about prepping on Facebook all the time yet has no food storage of their own, even though we know that if we do not store food we will not have any when the grid is down. We are like the guy who screams that the 2nd Amendment is the most important one of all…and yet has never owned a gun. Our own cognitive dissonance hampers us, renders us unable to contribute to the level we need to, and ultimately ensures our defeat. If we are to be true partisans, we all need to be aware of the existence of cognitive dissonance in our own lives, and take steps to mitigate it. We have no other choice, if we expect to be effective in our operations and our actions as patriots. Next time you catch yourself behaving in a manner that doesn’t fit information you know to be true, don’t change your perception or belief. Don’t alter your thinking so you can keep behaving the way you’re used to. Change your behavior to match the truth. 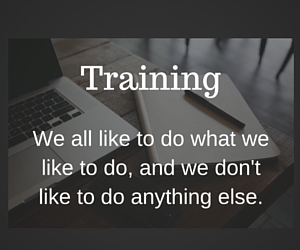 That may mean learning a new skill, training more often, or simply changing your diet and adding exercise. If it helps you, helps your group, and helps the cause, isn’t it worth it? An excellent jumping off point article for people to begin to conceptualize their own confirmation biases and how that can be a hindrance. The type of honesty and critical self-examination required to overcome both cognitive dissonance and deeply entrenched personal biases is in some ways a screening tool as well, IMHO.